The Bulldog loves people and the attention people give him. As a rule, he is a good, quiet companion. They are not the greatest watch dogs, although some potential intruders may be frightened by their looks. The Bulldog is a very even tempered dog, but it is important to teach him appropriate behavior at an early age. Puppy training classes and early socialization are key to good manners. A Bulldog does best in a loving environment, free from fear and neglect. They are happiest when there are people around. Left alone, a Bulldog (like any other breed) can be destructive. A crate is a good option when a puppy must be left alone. It is a source of protection and security but during the daytime should only be used for short periods. A crate is also very useful for house-breaking. No dog should be left in a crate all day. A Bulldog should never be chained, or otherwise left in your backyard alone. Not only is it dangerous to your Bulldog's well being, but a Bulldog is a high target breed for dognappers. A Bulldog is an indoor dog, and requires air-conditioning in hot weather. A Bulldog learns best with positive rewards training methods. Besides conformation, many Bulldogs successfully train to compete in Rally, Obedience, Agility and Tracking. Bulldogs are not lazy couch potatoes, nor are they jogging or cycling buddies. Exercise is important to build stamina and prevent obesity, but don't overdo it, particularly when it is hot or humid. Bulldogs can be very energetic, and your Bulldog might go all out playing and not know when to stop. Monitor his activity so he won't over do it. Don't let your Bulldog jump from heights, such as the bed, especially when he's growing or he could damage his growth plates. When he's older, repetitive landings could stress his joints and lead to arthritis. Teach your Bulldog to go up and down stairs carefully for his safety. Bulldogs should not be "free-fed"have food available all the time. Adult Bulldogs should have two regularly scheduled feeding of a quality food morning and evening. Bulldogs should not be fat. Excess weight on your Bulldog will stress his joints, heart and other organs, increase his sensitivity to heat, and reduce his lifespan. Your Bulldog should have a "tuck up," in other words, his tummy should not rest on the same plane as his chest but should "tuck up" into his body, and a waist (a pear shape when viewed from above). Avoid giving your Bulldog food from the table. As with other short nosed (Brachycephalic) breeds, it is necessary to keep a watchful eye on your Bulldog in hot weather or in any stressful situation, making sure he has shade and clean water. NEVER leave your Bulldog alone in the car in warm weathereven a couple of minutes could prove fatal. Like any other breed, Bulldogs may be prone to a variety of health problems. Before you buy a puppy, ask the breeder about health problems in his bloodlines. Many Bulldog breeders test for known genetic issues. However, even if both parents are healthy, a puppy can develop any one of the more common health problems from several generations back. Buying a puppy should be done with care, and not on the spur of the moment. Take time to research the breed. Some common Bulldog health problems you may encounter are: an elongated soft palate, small trachea, allergies, dermatitis, demodex mange, ectropion and entropion (eyelid anomalies), cherry eye, stenotic nares, patella luxation, hip dysplasia, and heart problems. Not all veterinarians are knowledgeable when treating Brachycephalic breeds. 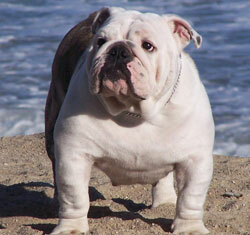 Obtain a veterinary reference from your breeder, or your local Bulldog club. Despite being short haired, Bulldogs are NOT low maintenance. They require regular, even daily, care. Bulldogs do shed, and spring and fall can be heaviest. During periods of heavy shedding, they should be brushed at least three times a week using either a soft brush or rubber curry brush. Brush against the hair, and then with the hair. Rub him down with a cloth afterwards. Otherwise, once a week brushing is usually fine. For bathing, use a shampoo formulated especially for dogs and bathe him as needed, every 1-3 months, or if he gets dirty and smelly. Make sure water doesn't get in his ears. Ear cleaning can just consist of a gentle wipe with a soft cotton pad. Be vigilant if your Bulldog has a tight screw tail, especially if he has an inverted tail. If this area becomes moist, it can become irritated. Be sure to dry it well, but gently, and apply a little talcum powder or cornstarch if needed. A Bulldog's nails must be kept short. A Bulldog's feet carry a lot of weight and long toenails can cause foot distortion, put stress on his joints, and may contribute to inter-digital cysts. Don't overlook the dewclaws. Teach your Bulldog to accept nail trimming from puppyhood. Take it slow and gentle so you don't "quick" him. You may use dog nail clippers, followed up with a grinder (such as a Dremil), or just a grinder if you are good about keeping the nails short. Bulldog wrinkles need to be cleaned DAILY. Clean the nose roll and any other deep wrinkles using either unscented baby wipes or soft tissues. Dry the wrinkles well but gently. Keep after tear stains so they don't stain. Keep the nose lubricated so it doesn't get cracked and crusty. Talk to your breeder or Bulldog club members to get tips on the best products and methods to manage Bulldog care. Bulldogs LOVE to chew. Provide them with safe chewing options so they don't chew items they shouldn't have. Get your Bulldog accustomed to dental care from a young age. Gently clean his teeth with a rough wet washcloth, or a toothbrush and a dog-formulated toothpaste. Regular dental care will reduce tartar build-up and minimize the number of times he will need to be sedated for veterinary teeth cleaning. Check his gums regularly, keeping an eye out for any pockets where hair and food might accumulate, particularly along the upper gums. Wipe these areas out carefully with a wet Q-tip. The Bulldog is not a breed for everyone, but he will amply reward those who invest time and energy in caring for him, training him, and connecting with him, with his abundant love and humor. Source: Revision of original BCNC article; BCA pdf; new content/Ed. » Back to Bulldog Information.